Is a heat pump the best solution for my home? Yes, heat pumps are one of the best home heating options for residents of Vancouver Island. Our moderate climate lends itself to having your system work very efficiently for your home. Installing a heat pump will help you save money on your home heating bills, clean the air in your home and dehumidify your home in hot summer months. Do I need ductwork to have a heat pump in my home? No, Ductless heat pumps are an excellent and very popular alternative to conventional ducted systems. Will my system require back-up heat? While some systems will require a supplementary heat source for when the outside temperature gets too low, our mild weather allows residents to enjoy the benefits of VRF (variable refrigerant flow) heat pumps, however, also produce heat efficiently even in extreme temperatures. The performance of these systems often negates the need for supplementary heat. The end result is a significantly more efficient system which means lower operating costs! How often should I replace my filter? And what should I replace it with? For your average residential filter 1” – 3”, manufacturers basically recommend that you change them bi-monthly which is a great rule of thumb but may not suit everyone’s individual needs. When choosing what kind of filter you need, it is important to remember that airflow is a critical component of your system. Disposable pleated filters are constructed of paper and polyester and do a good job at filtering most household particles and allergens, however, they may limit airflow. Disposable fiberglass filters filter out less allergens and finer particles but allow greater airflow. The higher the cost of the filter, the more dust and particles it will collect. We recommend finding a balance that works for you between indoor air quality and the frequency in which you change filters. How long will my heat pump last? The life of your heat pump depends on many factors, such as the type of heat pump, your location and how well and often it is maintained. Heat pumps normally last an average of 18 years. Heating, ventilation and air conditioning systems require proper and regular maintenance in order to work efficiently. Westisle’s experienced team will work with you to help maximize the life of your system. Westisle Heating & Cooling offers a full range of heat pump and furnace options with respect to efficiency and cost to suit every budget. This includes new variable speed or VRF (variable refrigerant flow) models from Trane and Mitsubishi. These systems offer exceptional performance in cold weather and are among the quietest systems available. The cost will depend on factors such as the size of your home, the type of system you are installing, the brand of equipment, electrical needs, ducting needs and so on. Our friendly, experienced service team is happy to visit your home and provide a free, no-obligation assessment and quotation. What is an ‘Air Source’ heat pump? An air sourced heat pump uses a compressor and refrigerant to extract heat from the outside air and brings it into heat the home. This type of system uses a fraction of the power that an electric furnace would need to heat a home because most of the heat is coming from the outside air. Air sourced heat pumps are also able to cool and provide air conditioning in the summer. Click here for more information from Natural Resources Canada. Westisle is also able to offer a full range of heat pump options with efficiency and cost to suit most budgets. This includes new variable speed or VRF (variable refrigerant flow) models from Trane and Mitsubishi. These systems offer exceptional performance in cold weather and are among the quietest systems available. How do I know what size of heat pump I need and where to situate the outside condensing unit? A Westisle customer service representative will be happy to come out to your home and do a complete heat loss analysis to determine the size and location of your new heat pump. What gets hooked up to my existing furnace when I add a heat pump? 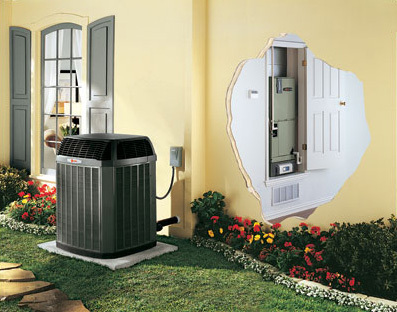 An example of a split heat pump application (an indoor air handler and an outdoor unit). A disconnect electrical switch will be placed close to the outdoor condensing unit. Two small diameter copper pipes (one suction line and one vapor line) will be extended from the condensing unit and run into your furnace. These lines will be installed with great care as to look as pleasing as possible. In the furnace area the pipes will be hooked up to an ‘A’ coil inside the plenum of your furnace. 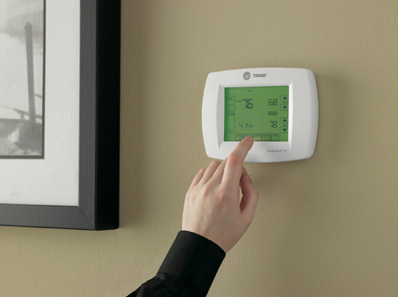 If needed, we will install a new thermostat to control your new heat pump investment. Westisle can also offer you a full seven- day program capability thermostat as well. We are looking at building a new house using a heat pump as our main heat source. Can Westisle Heating & Cooling help us? Yes, Westisle personnel will be happy to study your blue prints and make the appropriate recommendations. Westisle will give you a detailed quote on a full installation including ductwork, thermostats and heat pump. We employ only government certified sheet metal and refrigeration technicians to service your needs. The entire job is tested and warranted. What if I wanted to get rid of my old oil furnace altogether? Could I get a heat pump and more efficient back-up heat? Yes, you could replace your old furnace with an air handler and optional electric heat (as per below). In most cases, the new air handler will be smaller than your existing “old” oil furnace. The electric back-up heat would only come on occasionally. What is SEER, TONNAGE and AFUE? SEER: The seasonal energy-efficiency ratio (SEER) rates how many BTU’s an air conditioning unit will produce for each watt of electricity consumed. The higher the SEER, the less you spend on operating costs. TONNAGE: An air conditioning ton equals 12,000 BTU/hr. AFUE: The annual fuel-utilization efficiency estimates how much heat a unit delivers for every dollar spent on fuel. Copyright © WestIsle Heating & Cooling.